(Phys.org) -- Parents take heart  the alarmingly abstract masterpieces produced by your children could be teaching them how to reason like an adult. 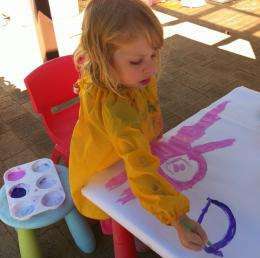 A research project just completed by Murdoch University lecturer Caroline Nilson has suggested that encouraging artistic expression in children may play a key role in establishing critical thinking skills. Ms. Nilson observed the artistic endeavors of 150 children from four local schools who participated in the Mandurah Stretch Festival, a major regional arts festival that uses arts and culture to connect the community. She then surveyed a group of teachers and parents to explore their perceptions on how the childrens critical thinking skills had developed during the four month project. Surveyed teachers and parents agreed that at the start of the project the participating children were very passive, waiting for information to be poured into them, said Ms. Nilson. However by the end of the project we saw the children had grown confidence in their artistic decisions and had learned a great deal about action and consequence, which are both signs of critical thinking. This study has shown that critical thinking abilities are developed in children as young as eight and nine years of age through engagement in creative arts. Ms. Nilson, who completed the research as part of her Masters degree, is calling for teachers, parents and community leaders to recognise the vital role of art in the development of young children. The role of the arts in the community must be considered more seriously, Ms. Nilson said. More must be done to fund and expand the arts to be accessible to all segments of the community and it is vital that home, education and community environments are focused on the early development of critical thinking abilities in young children. Currently art is thought of as an add-on in the school curriculum but it should be considered as vital as mathematics or English in a childs learning development. Art is not just about creating charming pictures to hang on the wall; it is actually the process of thinking creatively which is so important. Kids should have the confidence and freedom to follow their imaginations rather than producing something perfect and representative for their portfolios. Ms. Nilson hopes to see more emphasis on the importance of specialised art teachers in schools and the involvement of artists in community projects. Children are losing the ability to play freely and express themselves creatively, and this may have real consequences for developing their future skills in critical thinking, she said.